As Australia’s biggest city, Sydney can sometimes be a stickler for traffic, but that doesn’t mean driving has to be dead time. 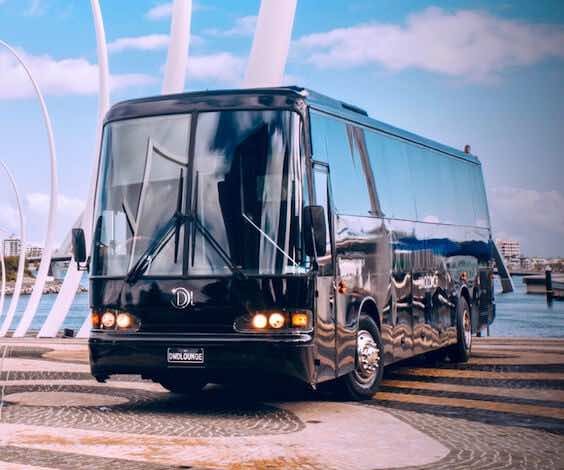 Roll from A to B in style on a Party Bus and enjoy some extra special onboard entertainment. By the end of the night, the wheels won’t be the only thing going around and around on this bus. Everyone knows that every guy’s two true loves are big motors and beers with the boys. What do you get when you combine those? A damn good time on a Party Bus. Whether you’re partying your way through a pub crawl, ticking off the tourist attractions or just en route to your night on the town, you’ll always arrive in style on a Wicked Bucks Party Bus. 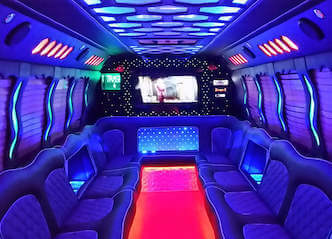 With state of the art sound equipment, disco lighting and dancing poles, this will be a ride to remember. Get in touch with our specialist bucks party planners for a tailored bucks activity package. She’s big, she’s loud and you can ride her all night long. This Party Bus tour will go down in history. No one likes being the designated driver. With pre-arranged transport, the entire Bucks Party can get cheeky and freaky on the dance floor without having to worry about finding a ride home. Sydney is an internationally renowned destination. While there are tourist sites to tick off your bucket list around every corner, you might be a little distracted by your desire to party. Why not combine the two and party your way around the iconic scenes of Sydney? It’s sure to produce some creative tourist selfies. Although we know you’re keen to strut what your Mumma gave you on the dancing poles, we can also arrange some special entertainment to show you how the professionals do it. We can hear your mates thanking us already. Our Party Bus Drivers have got all the local insight. They can take you away from the standard venues and design a tour to suit your party. Sydney is Australia’s largest city and with more than 12,368 km² to explore, there is literally something for everyone. From postcard-perfect beaches, the iconic harbour, a New York style skyline and luscious national parks, your instagram content will be absolutely peaking. The East Coast hub is pretty temperate all-year round, averaging at 26 degrees in summer and only dipping to around 18 degrees in winter. If that hasn’t sold you yet, Sydney is also Australia’s Capital of Party. With an abundance of nightlife options and endless restaurants to choose from, your biggest struggle may be picking a venue to kick start your night. Just when you thought it couldn’t get any better, Wicked Bucks has something for the adrenaline junkies too. Axe Throwing: If you haven’t seen Game of Thrones, you’ve obviously been living under a rock. But now Jon Snow isn’t just confined to the small screen – You can live a day in his life. Dust off your viking hat and stretch out your arms, You’re going to be throwing axes like a pro. Paintball Skirmish: Every guy loves a bit of ball action. But playing with these balls can be so rough, you’re almost guaranteed to leave with some gnarly bruises. Whip out your army style tactics and brace yourself for the best Paintballing experience in Sydney. Indoor Bubble Soccer: What’s round, squishy and fun to play with? Indoor Bubble Soccer, of course! At Indoor Bubble Soccer your patented bubble suit will let you run, bounce, roll and spin, all while bumping into other bubbles. That’s some pretty fun ball play if you ask us.